Politics / News Mayor Rahm's school board takes a big stand! 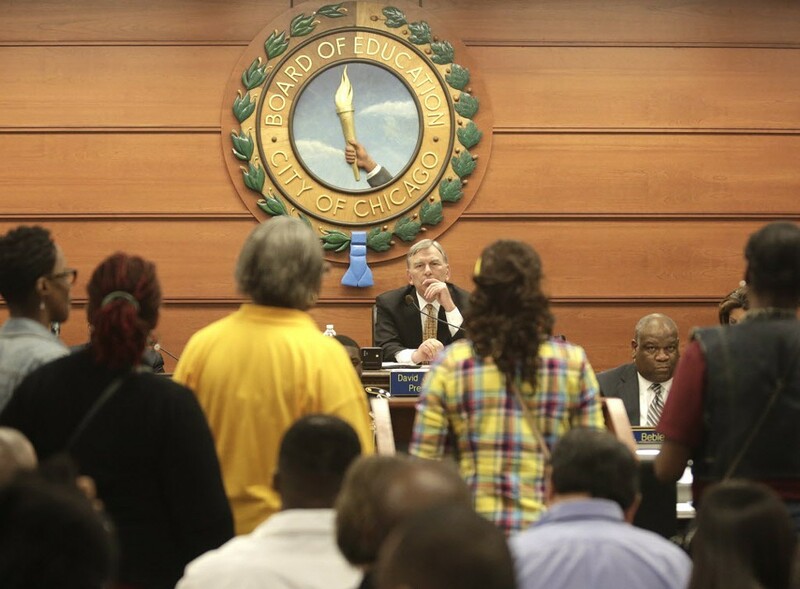 Chicago Board of Education President David Vitale, center, listens to opponents of proposed school closures at a packed board meeting Wednesday, May 22. At the risk of sounding naive, I was hoping that at least one of Mayor Emanuel's school board appointees might take a break from voting to close 50 schools and mention the $55 million the mayor wants to spend on his near-south-side hotel and basketball arena. As you know, the board voted yesterday to close those schools on the grounds that the system's too broke to keep them open. And yet the school system's not so broke it can't afford to contribute about $28 million of the $55 million in property tax dollars that Mayor Rahm wants to spend on the hotel and DePaul basketball arena. It's even worse. The hotel/b-ball arena project will wind up costing the schools money. Because by buying the land, Mayor Emanuel will make it tax exempt, and the schools will no longer be able to tax it. So they'll have to raise the taxes on everyone else's property to compensate. Lucky us! In short, the mayor's proposing to spend $55 million on a project that will cost the schools money and raise our property taxes. As I may have explained once before—right here. And will undoubtedly explain again. In the hopes, faint though they are, that someone in a position of power will gather up the courage to tell the mayor, "Uh, you know, boss, maybe it's not a good idea to spend $55 million in property taxes on a venture that will lose money for the schools." Unfortunately, there was no such appointee up to the task at yesterday's school board meeting. Once they got through listening to parents, teachers, and students wailing, crying, and pleading to please, please, please save their schools, the board members cast their vote with the mayor and called it a day. And not one word about the $55 million hotel/b-ball arena deal. It's all part of a larger, ongoing charade where board members—just like CPS CEOs—pretend as though school finances are limited to whatever it says on mayoral press releases. And that about $250 million a year—well over $2 billion in the last decade—wasn't flying out the window to the mayor's tax increment financing program, which funds things like the $55 million hotel/DePaul basketball arena. Now that I think about it, there was one funny moment in what's been a grim stretch of school news. It occurred a couple days ago, when the mayor told reporters that he didn't know which way the board would vote on the school closings. You know, as if he didn't put them on the board precisely because he knew they'd vote whichever way he wanted. "You don't know what they're going to do," the mayor said. "The board still has questions. To this very moment they're still doing the responsible thing for children by interviewing and analyzing stuff." That's right, Mr. Mayor. I'm sure they were up all night poring over school-utilization tables. The funny thing about school board members—or any mayoral appointees, for that matter—is that in their real-world careers they're often supersmart high achievers who presumably would never, ever make decisions based on the flimsy, flawed, and faulty information that gets publicly disseminated around here. But put them on a mayoral board and it's like they turn into a bunch of rubber stamps. It gets me thinking about this letter to the editor I happened to read in today's New York Times by some fellow named Jeremy out of Pittsboro, North Carolina. Jeremy was hot and bothered cause the Times had dared to criticize the Apple corporation for avoiding billions in federal income taxes by setting up a shell corporation in Ireland. A plot so ingenious I wish I'd come up with it. Jeremy wrote, " Tax avoidance is legitimate; there has been no hint of tax evasion, which is illegal. "The company's management has a fiduciary responsibility to act in the best interest of its shareholders; ignoring the opportunity to reduce its tax bill might be considered negligent." I'm not saying I agree with him on Apple's tax issues. But I think we should bring Jeremy to Chicago to be a watchdog for Chicago's shareholders—the taxpayers. If CPS were a private corporation, I suppose the Jeremys of the world could accuse its board overseers of fiduciary mismanagement for signing on to one bad TIF deal after another that drains money from the schools and jacks up our taxes. But, of course, Chicago's not a private corporation. It's not really a democracy either. More like a Rahmtocracy, which is similar to an oligarchy—only with more swearing. Well, hope springs eternal . . .
As its currently proposed, it look as though Mayor Emanuel's $55 million hotel/basketball arena will need approval from an entity known as the Joint Review Board. Which, by the way, is generally so submissive to the mayor that it makes the school board look like a band of tigers. The other day I was hoping that Governor Quinn would oppose this hotel/arena plan. Well, here's hoping that the CPS member on the Joint Review Board denounces the mayor's arena/hotel plan as a waste of desperately needed money.